Peruvian officials report that more than 50 people were arrested at Peru-Colombia border. During an operation against drug trafficking in the border, FARC (Revolutionary Armed Forces of Colombia) dissidents were caught. 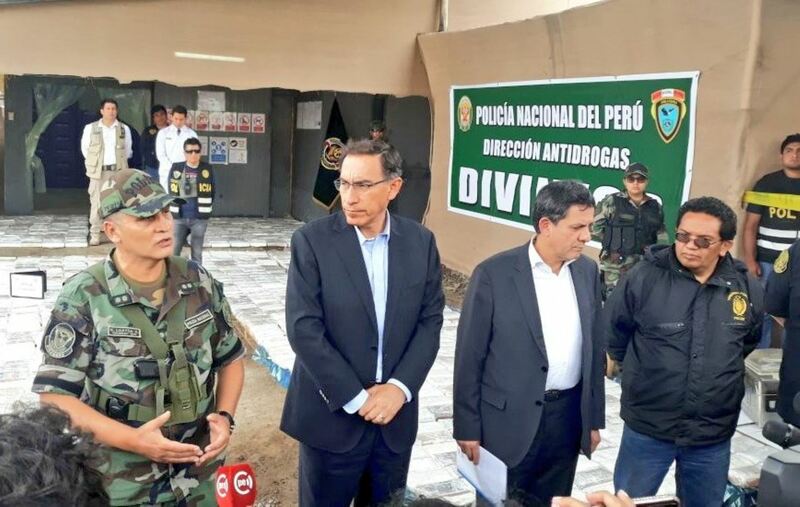 Earlier on Monday President of Peru Martin Vizcarra claimed about an operation ‘Armageddon’ that united his country’s security forces and Colombia’s military in the war against drug trafficking. The President said, ‘More than 50 people have been arrested, the vast majority Colombian nationals who were involved in illegal drug trafficking’. Officials of Peru also reported that four cocaine labs were deactivated. The operation in the region followed repeated attacks by dissident FARC rebels on security forces in nearby Ecuador. According to Colombia’s defense ministry, 1,200 fighters for the former FARC refused to demobilize under a 2016 peace agreement with Colombia’s government and have continued with drug trafficking activities. Vizcarra declared a state of emergency on Sunday for the province near the border with Colombia and Ecuador. The document went into effect on Monday. Under the state of emergency civil liberties are suspended and military force is authorized to maintain order in the region for 60 days. Earlier in May, rebels distributed pamphlets, calling to welcome them. ‘We are not a group of criminals or drug traffickers as they call us. We are FARC rebels. We ask for financial support from the mayor … and we call on the youth to join our ranks.’ it read. Drug Trafficking is one of the biggest problems for Peru today and declaring a state of emergency in the region proves this fact. War against drug traffickers has become a big challenge for authorities not only of Peru but also Colombia and Ecuador. ‘Drug trafficking is cancer that mixes with corruption and together they endanger our country’s development,’ the President of Peru said. Authorities of the country are faced with the need to improve their methods to prevail in this war. And modern technologies can be a real panacea for these complicated tasks. But it is very important to find that technology that can be really effective in solving these problems. Modern technologies have become an integral part of almost every aspect of our life. This has improved the security level in our life along with improvement in quality of life. And iCognative by Brainwave Science is one of them, an ultra-modern technology that virtually makes it impossible for criminals to hide and lie. iCognative is a special technology that can be used in various areas like National Security, Law enforcement, Border Security, Immigration and also Drug Trafficking. It is a specific test that can help to border security to find out if a suspect has specific crime-related information (that can be known only to a perpetrator) in his/her brain. The technology determines the possession of such knowledge by measuring and recording brainwaves. When the suspect is faced with known confidential information his/her brain releases special brainwave responses (P300/P300 MERMER) that are not under his/her control. iCognative collects such brainwave data during the test and at the end of the test with 99.9% accuracy determines if the confidential information about the crime is stored in the suspect’s brain. In the case of the drug trafficking at Peru-Colombia border, iCognative can help to prove the guilt of suspects and find out more criminal connections. At first, a test case needs to be built with confidential information (called stimuli) to input into the iCognative system. In this case, for example, we can use the date and the time of illegal crossing of the border, names and photos of partners in crime, information regarding drugs manufacturing and selling etc. This stimulus is flashed on a screen that suspect is asked to look at. Without human intervention, at the end of the test, the iCognative system objectively gives final determination whether the suspect’s brain has confidential information related to the crime or not. With the help of iCognative, border security agents can quickly determine suspects’ involvement in drug trafficking. The use of this ground-breaking investigative technology can help solve complicated crimes quickly, effectively, saving time and efforts of border security agencies.